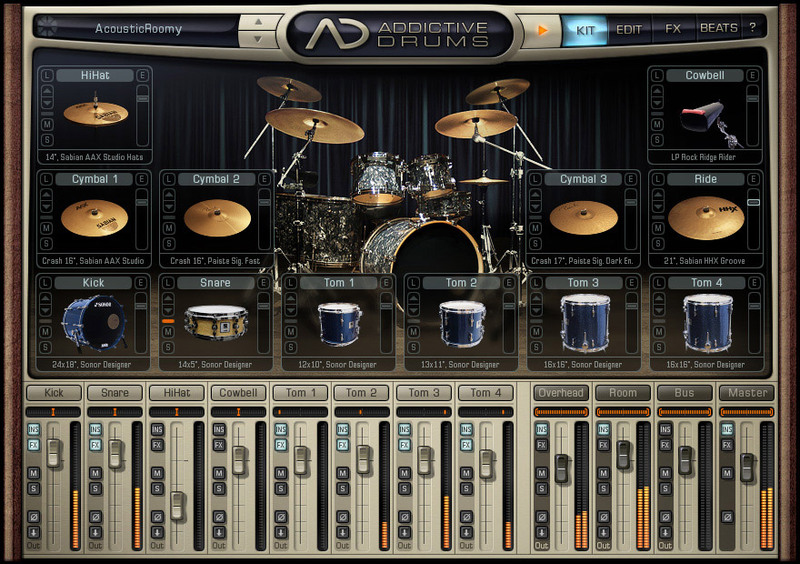 Addictive Drums is a drum production virtual instrument software from XLN Audio. Addictive Drums is a Complete Virtual Drum Production Studio. Flexible and intuitive, you will enjoy creating life like drum tracks in a short amount of time. It comes with 3 complete drum kits, and a number of extra drums and cymbals. The samples included carry every dynamic and nuance variations, from the softest to the hardest strikes. It also includes a number of stroke variations (hihat has 12 variations, snare has 6 for example) with alternating samples through-out to make sure your drum track varies and sounds human like. All sampled drum/cymbal sounds are recorded professionally with a multi channel mic setup, just as you would record a real drum kit. Check out our report on Cheap Studio Monitors for home recording & mixing. Multiple outputs in Logic 8. Cowbell slot renamed Xtra and is now used for various percussion instruments. Posted by Anonymous on Sat, 06/02/2012 - 16:57. Posted by gustavo on Tue, 05/22/2012 - 01:50. Posted by snevalai on Fri, 04/13/2012 - 09:15. I have Roland TD-9 drums,and I want to use them to trigger a drumming software on a WIN XP SP3 computer. Now I'm using Toontracks EZDrummer/Toontrack Solo for that purpose. I also have M-Audio Midisport Uno midi-usb and Asio4all driver. The system is working allright. However, I'd like to switch to Addictive Drums for more versatility. The problem is that I cannot see AD in my host software, in Reaper. When I add "a virtual instrument on a new track" in Reaper, EZDrummer is shown, but AD is not in the instrument or in the Vst/Vsti lists. Addictive Drums.dll does exist in the c:\program files\Steinberg\Plugins- folder /just like to EZDrummer.dll). Reaoer toI have also copied the AD dll to c:\program files\Reaper\plugins- folder. I have made Reaper to scan both folders, without any help. Is there any workaround for this problem, or do I really need to go for the Superior Drummer???? Posted by Sab on Sun, 10/09/2011 - 04:39. Posted by Peuneda on Fri, 07/03/2009 - 13:19. I made the download to check your program Addictive Drums v1.1 . The question is that after install, I did not have the Icon application. The Icon on Programs is only to Remove the program. It means that the Application is not there. Could you please help in order to have it? Posted by Anonymous on Mon, 02/15/2010 - 23:29. It is not independent software you need VST hosting software like Cubase , Reaper etc. I have the Reaper software. Posted by Anonymous on Sun, 08/29/2010 - 00:46. I have the Reaper software. When I create a new track and go to add a new fx, addictive drums is not in the list of VST plugins. How to I make it so Reaper can recognize addictive drums? Posted by Ace on Mon, 11/29/2010 - 20:23. Posted by Ace on Mon, 11/29/2010 - 09:39.